Assembly language is way more fun than I remember. 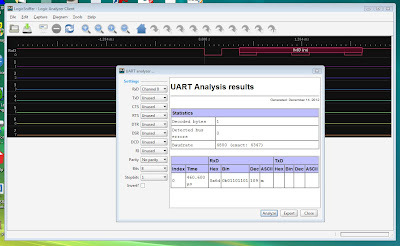 I implemented a very rudimentary software serial transmit on an ATtiny13. Really just to see if I could. Receive is harder. I didn't do that because I don't really need it right now. If you dare me I might do it. But for now the communication is in one direction. Most typically, serial communication involves 8 data bits, no parity, and one stop bit (8N1). When sending TTL level (5V and 0V) serial, the idle state of the line is 5V. 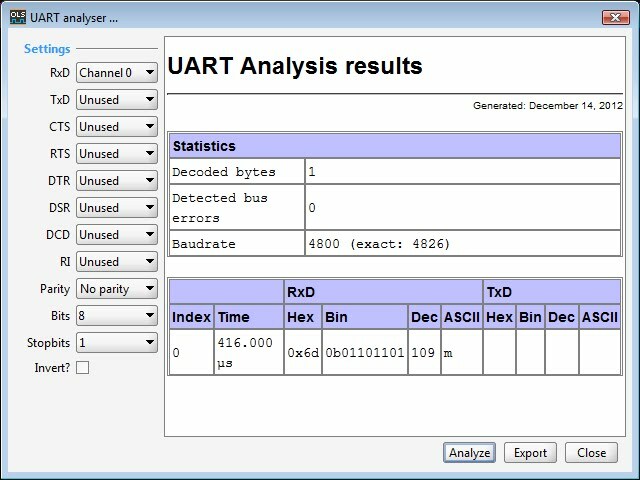 A start bit, 0V, is sent as the first bit, followed by the LSB of the data byte up through the MSB. After this, the stop bit is sent, a 5V signal. I started with the code that would send the data byte. I planned to use a timer interrupt handler for timing the bits, but as an initial baby step, I just created a loop that would shift bits out one at a time. 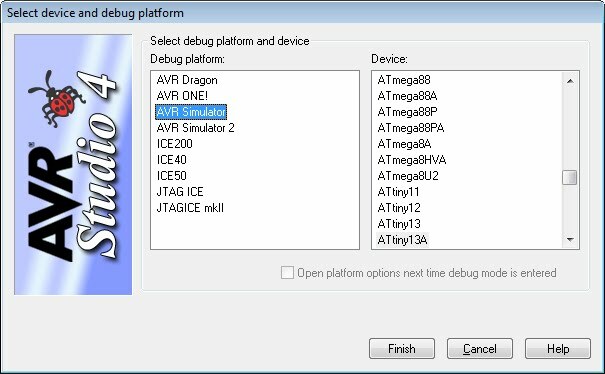 I used the Simulator debugger platform to watch the code and make sure it did what I wanted it to. 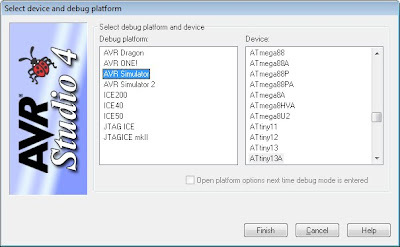 In AVRStudio 4, choose Select platform and device... from the Debug menu and select Simulator and your device. Next I added the logic to send the start bit. Instead of setting r17 to 8 I set it to 9 and then added special logic to send the start bit as the first bit. Finally I added logic to send the stop bit after the last data bit is sent or when bitcnt == 0. The stop bit is a high signal. Then, I reworked the code to run within an interrupt service routine. A simple way to deal with timing is to implement precision delay loops. Here's a link to my latest version that simply pauses after setting a bit and pauses in between bytes. Works great. I used this delay calculator. In this tool under Wine I could not generate a loop based on time input, but I could generate a loop by calculating cycles. A delay of 1000 cycles at 9.6MHz will give a 9600bps output assuming the chip's internal oscillator is correct. After tuning the loop, my Saleae Logic analyzer tells me the bitstream was clocking in at 4800.77Hz while sending out "U" (binary: 01010101) repeatedly. That's plenty close. In the original version which I can't find now, the transmit routine runs off a timer interrupt handler. 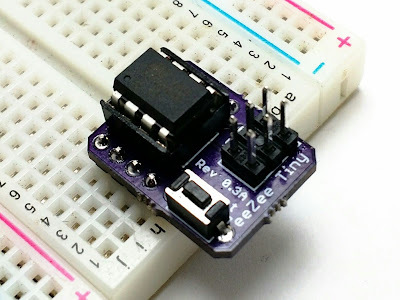 The ATtiny13 has one timer and you can set up an interrupt to occur on compare match. In other words, you put the timer in Clear on Timer Compare (CTC) mode and then set the compare register OCR0A to some number, and when the timer counter TCNT0 reaches that number, it fires an interrupt and then resets the counter. This is the method to schedule interrupts to occur at fixed intervals. I set up the timer, put in the code to transmit a byte. And it didn't quite work. The bit pattern looked right on the oscilloscope, so I pulled out my newly purchased Open Bench Logic Sniffer. 4347 baud is nowhere close! No wonder this didn't work. It told me the data was right but the baud rate was incorrect, 4347bps instead of 4800bps! 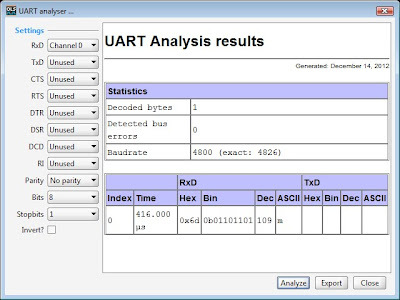 I had to change the OCR0A from 125 to 112 to get 4826bps, then the correct data appeared on my serial terminal program. Will it be close enough to work with the transmitter? I'll test that later. The ATtiny13A is running off an internal 4.8MHz oscillator that's roughly calibrated at the factory. I'm finding that the oscillator frequency is very temperature sensitive. As the chip will be braving the Colorado elements, I'll have to hope I can find a more stable clock source. That's it for now. I'll post more about the sensor project as I progress.